Another one for the roll call. Today's blog is Born Again '80's. It features remixes of songs from the 1980's and several of them are unofficial remixes so are by lesser known remixers. What's also great is that the remixes can be downloaded onto your I-Tunes page or wherever you like to keep your music. However, some of the songs can also be downloaded for a certain amount of time. I had to listen to how "Dirty Laundry" by Don Henley was reinvented and it's great, thank God. I just love remixes like this. The remix of "Dirty Laundry" is both fairly faithful to the original, which had a fantastic baseline already and now has a R2-D2 down the disco type mix in the background. The remix is by Mr Unclean and can be downloaded here. "Dirty Laundry" was inspired by media intrusion following the deaths of stars like John Belushi and Natalie Wood and is a song that could really apply to today's media. It's lyrics are fantastic. Here's a sample. Can we film the operation? Is the head dead yet? You know, the boys in the newsroom got a Running bet Get the widow on the set! We need dirty laundry You don't really need to find out what's going on You don't really want to know just how far its gone Just leave well enough alone Eat your dirty laundry Kick em when they're up Kick em when they're down Kick em when they're up Kick em when they're down Lisa Marie Presley did a rockier version of the song in 1995 and was featured on her album "Now What". The video also had a cameo from George Michael. Here it is. 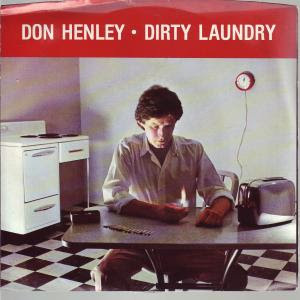 "Dirty Laundry" was one of many great songs by Don Henley. "Boys Of Summer", "New York Minute" and "Sunset Grill" are my other favourite singles by him. Don will be playing with the Eagles, once again, this year. Here's a concert performance of the gorgeous "Sunset Grill" from Don's 1984 album "Building The Perfect Beast".